Having the best kitchen knives at your disposal will definitely make you better, faster, and more efficient in the kitchen. 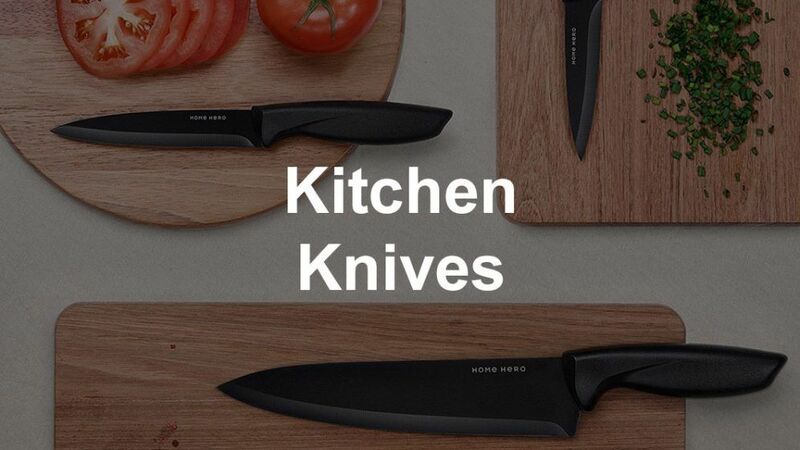 In this article, we will cover the most common types of kitchen knives, when to use each kind of knife, and what to look for when buying them. For the amateur chef, you can make do with only a few types of knives, but for those more experienced in cooking, you will find that different types of knives become important to have. There are combination knives available, but each knife serves its own distinct role. 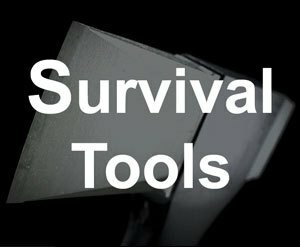 I went out and did a ton of research where I rounded up the most popular, bestselling, and top quality knives across different categories. 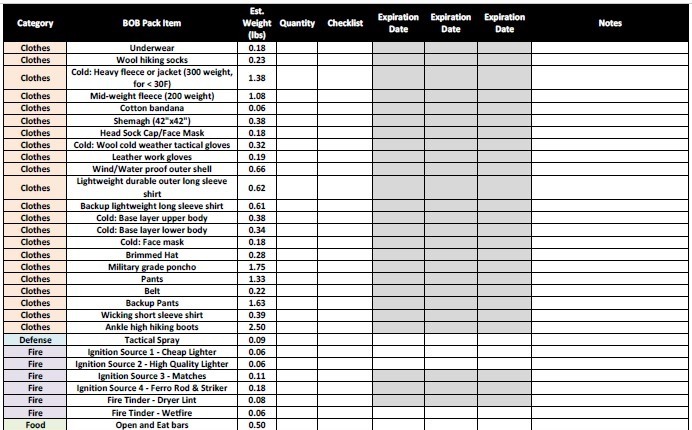 In this article, you can find those top choices to make it easier to find what you are looking for. Let's get into the details of the best kitchen knives for the money next. First up is the fillet knife. Fillet knives are used for filleting fish. The blade of a fillet knife is generally pretty long, narrow, and extremely thin. Blades are usually curved upwards at the end. A long blade helps when filleting fish, as it allows the user to cut through the meat without having to do too much sawing or reversing of the blade. Longer blades become even more important when filleting larger fish, as they have a wider girth. A great example is the Rada Cutlery R200. The thin blade allows for added flexibility, so that the user is able to follow the contours of the fish’s backbone. Narrow blades also allow for much more precise cuts, which is especially helpful in removing bones and cutting out the meat of smaller fish. A quality fillet knife blade is somewhat thicker closer to the handle, so that the blade isn’t too weak, but the end of the blade should be thin to allow for plenty of flexibility. The next knife is extremely similar to the fillet knife. A boning ﻿knife is used to remove meat from around the bones of any type of meat. It has a very similar shape to a fillet knife, in that it has a narrow and somewhat thin blade. Generally speaking, boning knife blades are thicker than the blades of fillet knives, and their blades aren’t as long. 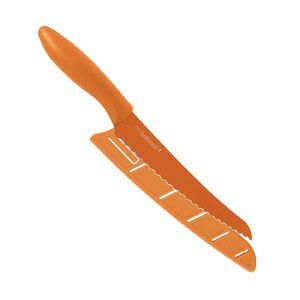 Since boning knives are intended for all types of meat, their blade shouldn’t be as flexible as a fillet knife. This will allow for more strength when cutting through tougher cuts of meat. When looking to buy a boning knife, a quality knife will have a bolster for added cutting strength and a blade that is easily sharpened. 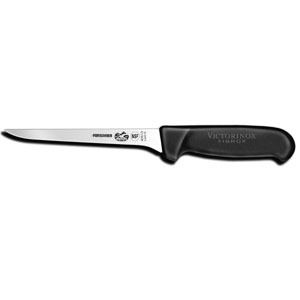 We recommend the Victorinox 6-Inch Flex. A quality blade will be thin, but not so thin that it becomes flexible. Next up is the carving knife. Carving knives have long, thin blades that allow the user to cut thin slices off large pieces of meat like turkey, ham, and roasts. Blades are commonly either straight edge or granton edge with a round tip. Granton edge blades have ribs along each side of the blade. When the knife is being used, the ribs will create air pockets, which allows the knife to easily glide through the piece of meat. A great choice is the Victorinox 12-Inch Granton Edge. As they’re intended to be used on roasts and other similarly large pieces of meat, a long blade is extremely important for carving knives. 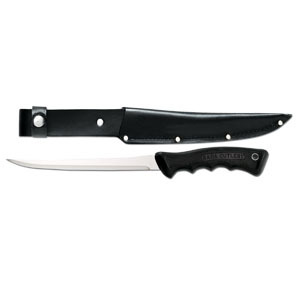 Granton edge blades are extremely high quality, but when looking at a tapered edge blade, a quality knife will have a bolster for more cutting strength and a comfortable, safe handle. 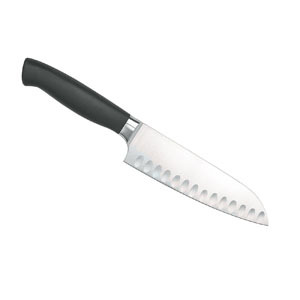 Santoku knives are general purpose kitchen knives, similar to a traditional chef’s knife. This style of knife has a handle that aligns with the non-cutting top edge of the blade. The cutting edge of the blade is flat, and the top edge of the blade enters into a steep curve to join the flat cutting edge (commonly referred to as sheep’s foot blade). Originating in Japan, the translation means “three uses.” These three uses are slicing, dicing, and mincing. An amazing option is the OXO Good Grips 6.5-Inch. Newer renditions are available with a granton edge. 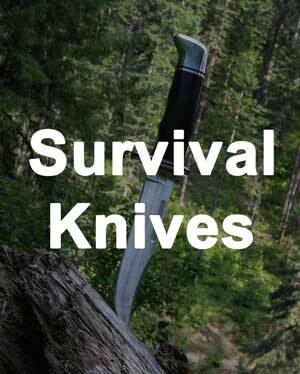 A quality knife will be extremely well balanced, have a flat cutting edge to reduce rocking, and will have a blade that is crafted from a very hard steel. Bread knives are extremely unique. 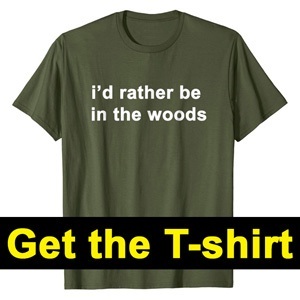 They are generally on the longer side of knives, and have fully serrated edges. The serrations on the blade of a bread knife are the most important part, as they allow the knife to cut soft bread without crushing it. 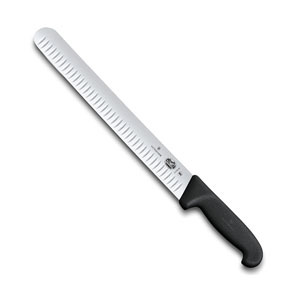 A quality bread knife is extremely important in any kitchen knife set, as no other knife is capable of doing its job. Most knives will simply crush your bread. When buying a bread knife, make sure that the blade is plenty sharp, as the serrations will make it difficult for you to sharpen. 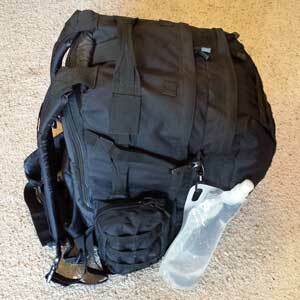 It should also have a comfortable handle that will protect your hand. I recommend the Pure Komachi 2. Paring knives are another general purpose knife. 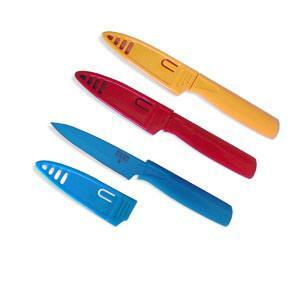 They are much smaller than chef’s knives and Santoku knives, and can cover a wide variety of tasks. Blades should be plain edge, and should be four inches or less. The much smaller blade allows for more precise and gentle work. The blade should also be somewhat flexible. When buying a paring knife, the handle is one of the most important things to consider. Check out the Kuhn Rikon Nonstick Colori Set. The handle should be both comfortable and safe, as you will find yourself reaching for this knife quite often for many different tasks. 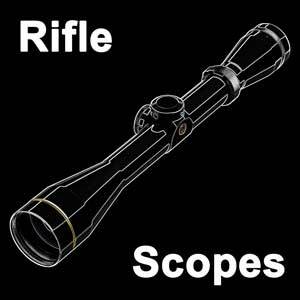 Another important factor to consider is a blade that is lightweight and handles well. Electric knives run the gamut of all kitchen knives. There are electric fillet knives, electric carving knives, electric bread knives, and more. 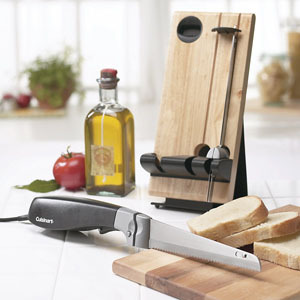 There are some electric knives that are available with interchangeable blades, allowing it to serve multiple purposes. Electric knives have a motor, which will generally allow for more cutting power than a plain knife can generate. When buying an electric knife, the most important things to consider are the safety features and the handle. A good option is the Cuisinart CEK-40. A quality electric knife will have plenty of safety features embedded, as using an electric knife is inherently more dangerous than a plain knife. There should be some type of safety button as well as an easy to access on/off switch. Cord storage is another safety factor to consider. 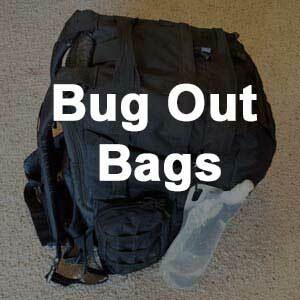 The handle needs to be extremely comfortable and allow for the firmest possible grip. Losing grip on an electric knife could cause a potentially dangerous situation.